Nikko, famed for being a World Heritage site, is situated northwest of Tochigi prefecture in the northern Kanto Region. Nikko Toshogu, the mausoleum of Tokugawa Ieyasu and an impressively decorated shrine, the fascinating 97m high Kegon-No-Taki waterfall and finally Lake Chuzenji are all sightseeing highlights. Furthermore, Nikko is the place to go for Tokyoites in search of the most beautiful fall foliage vistas which begin around October. An intricately decorated temple dedicated to Tokugawa Ieyasu who was responsible for establishing Tokyo as Japan’s capital. About 5 min. by taxi from Nikko Sta. Around 20,000 years ago, the lava from the volcanic eruption of Mount Nantai formed a ravine which became the origin of Lake Chuzenji. 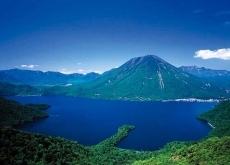 At the altitude of 1,269m, it is the highest located natural lake in Japan.